Just the name, Chicken Noodle Soup, says it all. It brings back memories of when I was a child and my mother always made her own soup. Her chicken soup recipe was my favorite. When we were kids we often picked up colds and nothing would get us back on our feet but a nice hot bowl of chicken soup. Here we have a very nice chicken noodle soup recipe and I will follow up with some changes our friend Susie made. This is a large recipe so be prepared to be ready to freeze some, unless of course you have a hungry group to feed. Using a large pot partly fill with lightly salted water and bring to a boil. Add the egg noodles and oil and boil for 8 to 10 minutes. Drain and rinse under cold running water. In a large saucepan combine broth, poultry seasoning and salt to taste. 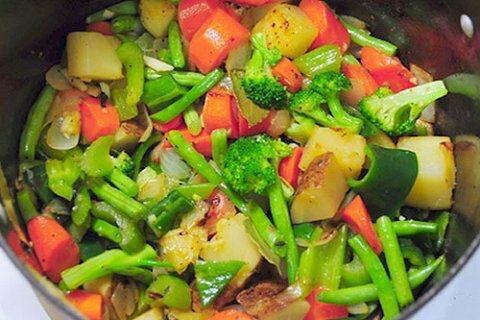 Bring this to a boil and mix in the celery, carrots and onions. Reduce the heat and let simmer for fifteen minutes with the lid on. Mix the cornstarch and water together in a small bowl until the cornstarch is dissolved. Slowly add this mix to the soup stirring constantly. Stir in the noodles and chicken and heat until your soup is perfect. A wonderful chicken noodle soup recipe. Some who have made this soup have changed the cut up chicken to adding an entire whole chicken that has been cooked on a rotisserie. Add the drippings from the pan as well. After cooking for fifteen minutes remove the chicken, cut off the meat and add this to the pot. Another suggestion is to eliminate pre cooking the noodles. Simply add them to the mix about fifteen minutes before serving. Finally you are the one to decide the amount of salt to add. 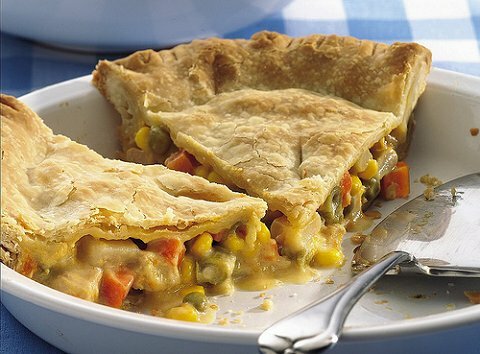 One of the great meals you could cook up for your family or friends is Chicken Pot Pie. It is a meal that fits halfway between a regular meal and a stew. Here is a wonderful recipe you should try. 1 pound of skinless and boneless cubed chicken breasts. In a saucepan using medium heat combine chicken, peas, carrots and celery. Cover with water and boil for 15 minutes. Remove from the stove and drain and set aside. In the saucepan using medium heat cook the onion in butter or margarine until soft. Mix in salt and pepper, flour, and celery seed. Slowly stir in the chicken broth and milk. Simmer at medium heat until thick. Remove from the stove and set aside. This goes well with a serving of the chicken noodle soup. Place the chicken mixture in the bottom of the pie crust. Pour the hot liquid over it and then place the top crust over it and seal the edges of the pie and cut away any excess dough. Make several slits in the top with a knife or fork so the steam can escape. Bake in the pre-heated oven for 25 to 35 minutes or until you see it has browned nicely. Notice the filling will be bubbling when ready. Let it cool for fifteen minutes before you serve it to your happy guests. Note: Some have had good success with roasting a whole chicken on a rotisserie and using the cut up chicken in place of the breasts. Chicken noodle soup. It's hard to beat your basic chicken salad recipe for the noon lunch. When it comes to a full meal though we go to the crock pot chicken and dumplings and get started with a nice bowl of chicken enchilada soup. Irma loves making roast chicken recipes and baked chicken breast. Another of her favorites the kids love is the chicken pot pie recipe.